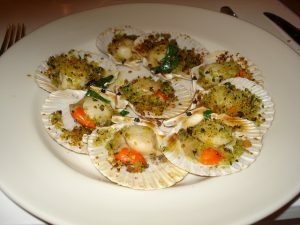 The foods of Man include, unsurprisingly, seafood and many of the foods and dishes you would find elsewhere in the British Isles. The food item that Isle of Man is likely most famous for, is the Manx kipper. 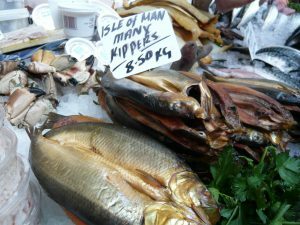 Manx kippers start as herring, which are then split, brined and cold smoked with oak chips on wooden rods. The result is a kipper that is not too salty or fishy and has a rich color and flavor. This process was at one time common in England, but is now primarily found on the Isle of Man. Kippers are a common breakfast item, but are also enjoyed at lunch or supper and incorporated into various dishes. 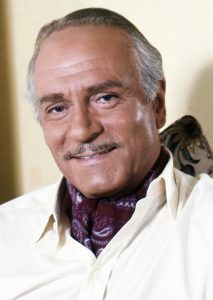 They were a favorite of actor Laurence Olivier who would enjoy them for high tea accompanied by champagne. island. These sweet tasting scallops are medium to small size, similar to bay scallops, are sustainably caught and since 2013 enjoy protected status. Besides seafood, Isle of Man is known for it’s uniquely flavored Loaghtan lamb, it’s cheese and dairy and oak smoked bacon. And yes, there is an annual Isle of Man Food and Drink Festival, which this year will take place on September 17 and 18. Chefs from around the island have their dishes judged and compete for the title of ‘Chef of the Year’.